Pronunciation is rendered visually to help bring a language learner’s pronunciation closer to that of native speakers. Learning to speak like a native takes a long time, as the subtleties of pronunciation are difficult to teach. Language solutions from Advanced Media allow users to learn correct native pronunciation in a fun, easy way. closer to native English pronunciation. Precisely indicates pronunciation errors made by each language learner while providing detailed advice. Creates an environment similar to one-on-one English conversation instruction. 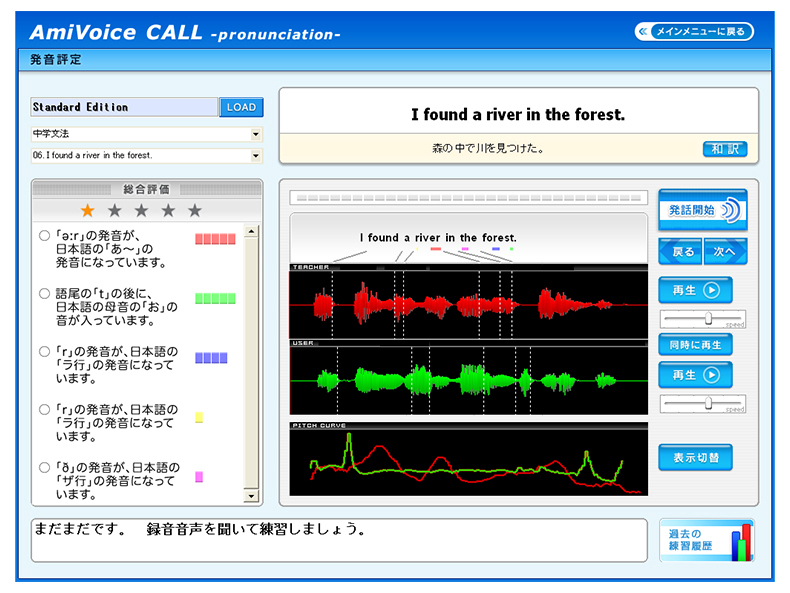 This solution combines a voice recognition engine tuned to recognize the English spoken by Japanese people (pronounced similar to Japanese katakana) and a pronunciation evaluation engine that indicates areas of English pronunciation that Japanese people find difficult at the phonetic level. 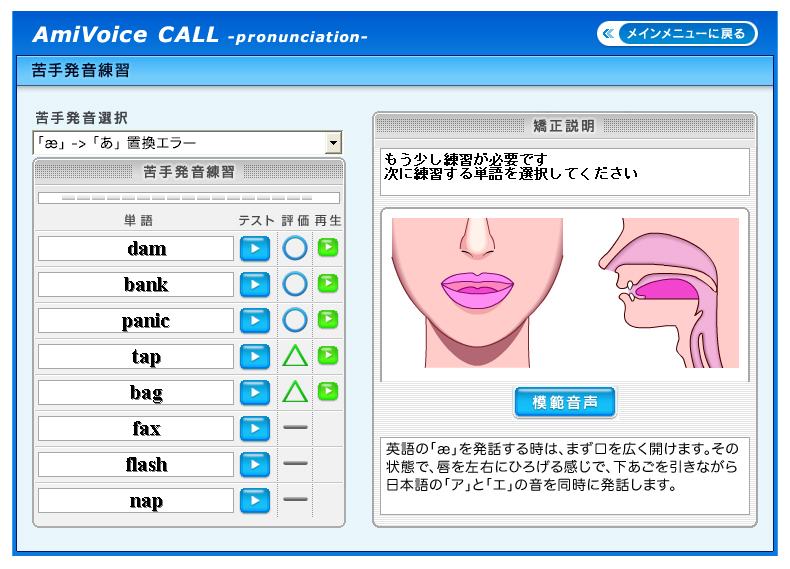 These two high-precision technologies create a system for specifically indicating pronunciation errors often made by Japanese people while providing related instruction. 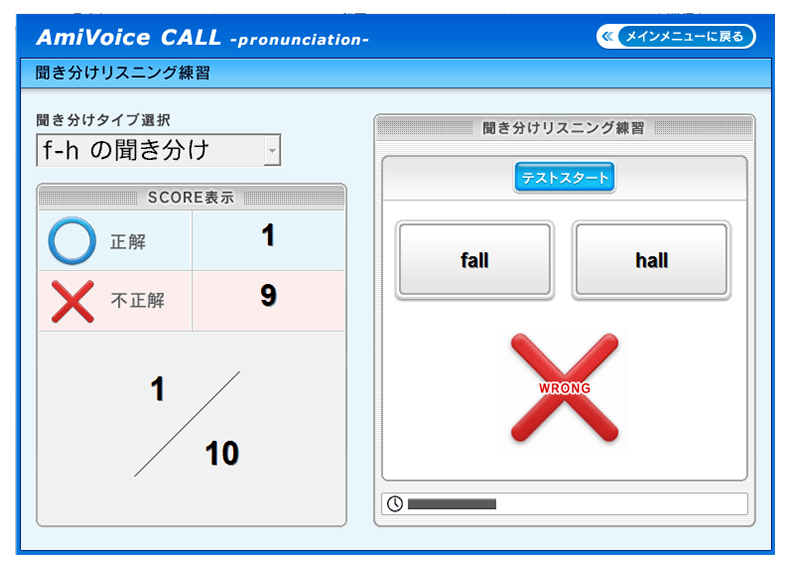 When the learner puts on a headset microphone and reads the target sentences or words, the system displays objective indications of the learner’s pronunciation errors on screen. The system allows those familiar with the weaknesses in their pronunciation to focus on these areas and improve their speaking skills. This also leads to improved listening comprehension. With practice, users can readily confirm their progress and problem areas, establishing the foundations for setting future goals. When the learner reads the displayed text, the parts of the sentence with pronunciation errors are displayed in a pinpoint manner. Allows focused practice at the level of individual words to address pronunciation weaknesses indicated on a pronunciation evaluation menu. Pronunciation results are ranked according to three easy-to-understand grades: correct (○), satisfactory (△), and incorrect (×). Displays practice results in order of weakest to strongest based on data from both pronunciation evaluation and listening practice. Graphically presents daily evaluations to allow a visual grasp of practice results. Allows the administrator to set IDs and passwords for each learner and manage learning data for each individual learner on the server. Settings ManagementAllows adjustments of error sensitivity and other aspects based on the learner’s level. Allows the administrator to adjust difficulty levels based on the learner’s skill level. 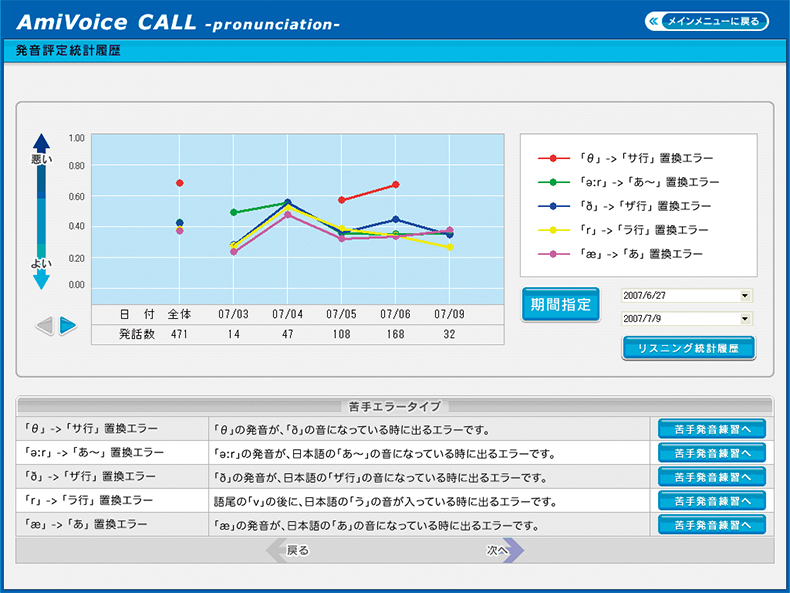 Voice PlaybackVisually presents learning data for all learners and allows playback of learner voices. Allows the administrator to view learning data stored on the server for all learners and to play back voice recordings. This solution has already been adopted by 308 institutions in total, including high schools and universities. Would you like to see a demonstration? Or try it? Please ask, if there are a question and a question. ©2014-2019 Advanced Media, Inc. All rights reserved.